The CSI Practice Guides are a library of comprehensive references specifically and carefully designed for the construction professional. Each book examines important concepts and best practices integral to a particular aspect of the construction process. 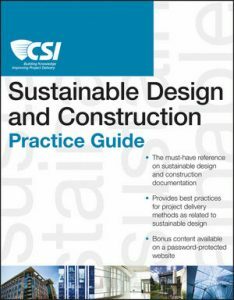 “The CSI Sustainable Design and Construction Practice Guide” compiles information and best practices for those who participate in some aspect of the design and construction of sustainable facilities. In this volume, guidelines on sustainable design standards and rating systems, along with detailed information on how to evaluate sustainable products and systems, and the roles and responsibilities of team members are meshed with best practices for proper documentation.